Before becoming ordained to full-time ministry in the Church of England in 2002, Paul Nicholson worked as an Early Keyboard specialist, in a career which included performance and recording as a soloist and director, chamber partnerships with baroque violinist Elizabeth Wallfisch, ‘cellist Richard Tunicliffe and the Viol Consort, Fretwork, and both continuo playing with, and directing the Orchestra of the Age of Enlightenment. 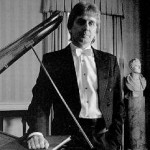 Having worked with Denys Darlow for many years he became Associate Musical Director with him of the London Handel and Tilford Bach Festivals from 1993 until 1998. On his departure from professional music Paul left a number of recordings, and in BBC Radio 3’s last ‘Building a Library’ comparison of recordings of Handel’s 1720 Eight Harpsichord Suites, his Hyperion disc was the reviewer’s choice. Paul is now Priest-in-Charge of St Peter’s, Belsize Park and St Saviour’s, South Hampstead.